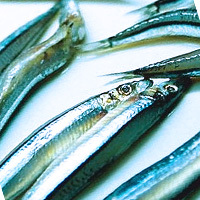 Silver-striped round herring often confused with the blue sprat is a type of fish caught in the summer months that inhabits the waters south of the boso peninsula near Tokyo Bay, Japan. It is used as bait for commercial fishing. It can be eaten in tempura dishes, pasta, and sashimi flavored with vinegar miso. The calories in Silver-stripe round herring per 10g(1fish small edible part) is 9 calories. Silver-stripe round herring is calculated to be 93Cal per 100 grams making 80Cal equivalent to 86.02g with 1.88g of mostly protein、0.14g of fat、0.01g of carbohydrates in 10g while being rich in vitamins and minerals such as Vitamin B12 and Vitamin D.